You wanted an inexpensive data share for your small business, so you went out and bought a NAS device from your local computer and electronics shop (or Amazon), set it up in your closet, turned it on, took five minutes to set it up, and got back to work. But setting up your new Z:\ drive was so simple and convenient, you might have forgotten a few things–like setting up notifications and alerts in case of hard drive failure or other errors, or keeping track of the credentials you used during the initial configuration. Months or years down the line, your NAS device breaks down, leaving parts of your business paralyzed. It’s a common story: one our NAS data recovery experts hear from clients all the time. Need data recovered from a broken NAS device? Click here to get started. Data recovery from NAS devices tends to be the kind of thing you leave up to professionals like the ones at Gillware. Due to their complexity, they can be difficult even for computer repair experts to troubleshoot sometimes. Sometimes, it can be unclear whether the NAS device’s hard drive (or drives) has failed or if something is merely wrong with a part of the enclosure. Due to their use of a Linux file system, as well as the possibility that multiple hard drives will be certainly linked in some kind of RAID array, an attempt to recover data from a NAS hard drive, even if the drive itself is healthy, is typically too challenging to do on your own, sometimes even with the aid of NAS recovery software tools. NAS, which stands for “network-attached storage”, refers to storage devices you can connect to wirelessly. NAS storage devices see use both in homes and small businesses, meeting a wide variety of data storage needs. Like any other storage device, though, these devices can and do break down, leaving their users without access to their data. There are many different brands and models of NAS device on the market. Many NAS device manufacturers also sell external USB hard drives and servers for businesses of all sizes. NAS devices manufactured for personal use include Western Digital World Books, which Western Digital sells alongside desktop-sized My Book external hard drives. NAS devices manufactured for use by small businesses, freelancers, or hobbyists, such as the Buffalo Terastation or Drobo 5N, are more like miniature and low-cost servers, often with four or five hard drives arranged in a RAID array. There are all sorts of components in a NAS device that can fail and cut you off from your data, including the hard drive (or hard drives) within the device. If you have a broken or malfunctioning NAS device, Gillware Data Recovery’s world-class experts can assist you with all of your NAS data recovery needs. What Makes NAS Devices Different from External Hard Drives? The most striking difference between a NAS device such as Western Digital’s World Book and a My Book external hard drive by the same manufacturer is the lack of USB port. A normal external hard drive plugs into your computer via a USB cable, allowing you to read data from and write data to the device. Instead, a NAS device will plug into your Internet router via ethernet cable. You can access the data stored on the device from your computer just like any other external hard drive, but your computer doesn’t have to be tethered to it. In addition, any other computer connected to your wireless router can also access the NAS device. Small NAS devices will often have a single hard drive inside them, like most external drives. But other models will have two hard drives, combined in a mirrored RAID-1 array for data redundancy. Hobbyist or freelance musicians, photographers, and video editors whose data takes up a lot of space can purchase NAS devices with four or five drives arranged in higher level RAID configurations. Components of a two-drive Netgear ReadyNAS, including the daughterboard, SATA expansion board, and fan. Hard drives not included. Inside the typical external hard drive is usually a normal and unmodified hard disk drive, along with a small USB bridging dongle that plugs into the drive’s SATA port. This is usually the only other piece of hardware in the device. A NAS device, by comparison, has a lot more. Connecting to your computer via Wi-Fi is more complicated than connecting to your computer via USB and requires more than a simple bridging dongle. A NAS device has a CPU, RAM, and even a small fan, especially if the device has two or more hard drives in it. It’s actually a miniature computer all on its own, with everything but a monitor—in terms of hardware, NAS devices are in fact very similar to servers. What Makes NAS Devices Different from Servers? NAS devices see a lot of use in small businesses as a small and low-cost alternative to large enterprise-grade servers. Generally, NAS devices have many of the same components as a server and can perform the same function, only scaled down. For a small business that only needs a four- or five-drive RAID-5 array to store and manage its Exchange email database or SQL database, a cheap NAS device is much more cost-effective and less budget-busting than a Dell PowerVault or PowerEdge server with a dozen hard drive bays. There is, of course, a downside to using a NAS device in lieu of a more powerful (and expensive) server. These devices are made to be cost-effective. The components they use, such as their RAM and CPU, are cheaper and less powerful than those found inside full-fledged servers, and can often fail and break down more easily than the components found in enterprise-grade server setups. This also includes the hard drives used inside the device as well. A full-fledged server will usually use enterprise-grade hard drives, which often have high-performance SCSI or SAS ports instead of the SATA ports found on consumer-grade drives. These drives also have specially-optimized firmware designed to make the hard drive better at doing the kinds of things it has to do in a server (as opposed to the hard drive in your computer). NAS devices, however, will have the same kinds of hard drives you can find inside your computer. They aren’t the best of the best, they’re not designed to run 24/7, and they likely all came off of the assembly line within minutes of each other. When one hard drive fails (which the device will often be fault-tolerant enough to withstand), a second or third hard drive failure might not be far behind. Thus, it’s important to keep these devices well-monitored. Many NAS device vendors offer the option of buying a NAS device without any hard disks included for a reduced cost. The owner can then choose to stock the device themselves. Stocking a NAS device with hard drives bought from multiple manufacturers and manufactured relatively far apart from each other may improve a NAS device’s longevity. Multiple-drive NAS devices, from the personal-use devices with two-drive RAID-1 mirrors, to the mini-servers with five-drive RAID-5 arrays, have a degree of fault tolerance. When one drive fails, the array keeps going without any data loss. But if you don’t replace the failed drive, it only takes one more drive failure to cut you off from your data. A NAS device can notify its owner via email when one hard drive has failed and needs to be replaced, and can even inform the user how to contact the manufacturer to receive a replacement hard drive. However, since it’s so easy to just start using a NAS device right out of the box, many users forget to set up these alerts. When one drive fails, another can fail days, weeks, or months later, without the user even realizing that the first drive had failed at all. When the next drive fails, the whole NAS device goes belly-up. In addition to physical failure, accidents, such as an accidental quick format, can also spell doom for the data on a NAS device. Some NAS device manufacturers, such as Drobo, use proprietary filesystems in their devices, which the user doesn’t notice but can confound freely-available data recovery software tools. Regardless of the reason, when you’ve lost data from your NAS device, sometimes you really need to get it back. In these NAS data loss situations, Gillware is here for you with our NAS data recovery experts. When your NAS device fails, Gillware’s NAS data recovery experts can retrieve your valuable data. With highly-skilled hard drive repair engineers in our certified clearoom data recovery lab and our expert logical data recovery technicians, the experts at Gillware Data Recovery can handle whatever your failed NAS device can throw at us. Hard drives have very sensitive and delicate moving parts inside them. When they fail, often one or more of these delicate components are often to blame. 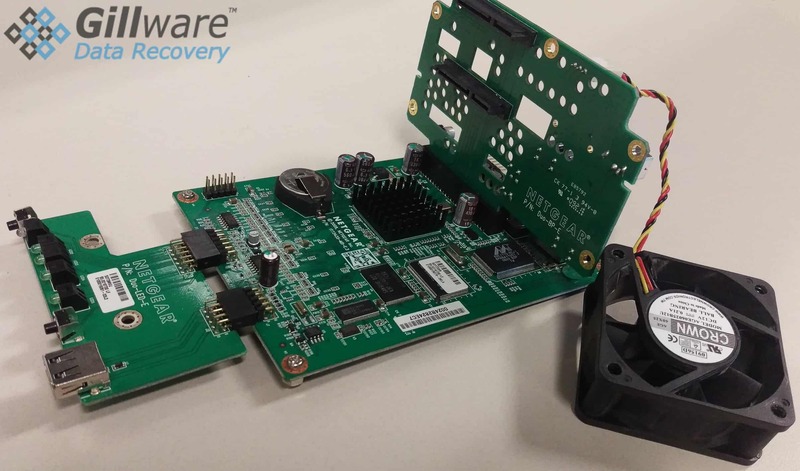 Gillware’s professional engineers can repair and replace failed hard drive components, such as read/write heads, control boards, and spindle motors. When hard disk platters become scratched or coated with debris, our state-of-the-art burnishing tools can clean the platters and save your data. What Is the Best NAS Data Recovery Software? Gillware uses the best NAS data recovery software to recover your data, a suite of proprietary tools designed in-house to assist our expert technicians in salvaging your important files. Our logical technicians can recover your data after an accidental reformat or reset erases the contents of your NAS device. Even if your NAS device uses a proprietary Linux-based filesystem or twists the data you write to it in an unusual way, our NAS data recovery experts can recover and piece your data back together. No matter the problem, Gillware’s data recovery experts are in your corner when you need data recovered from your NAS device. It’s not just about world-class skill, tools, and techniques. Gillware’s NAS data recovery services are also affordable and completely financially risk-free. We charge no evaluation fees. We can even provide an inbound UPS shipping label for you on our dime. We don’t charge you unless we successfully fulfill your data recovery goals. If we cannot meet your needs or the price quote for our NAS data recovery services just doesn’t work for you, you owe us nothing. We only ask for you to cover the cost of return shipping if you want your device returned to you (otherwise, we recycle your device free of charge). With prices 40-50% lower than other professional data recovery labs, Gillware Data Recovery makes our NAS data recovery services affordable as well as world-class in quality. In Gillware’s ISO-5 Class 100 certified cleanroom and SOC 2 Type II audited data recovery facilities, you need not worry about the health of your NAS device or the security of your data. You can sleep well at night knowing that your failed NAS device and the data we recover are both in good hands. No customer data ever leaves our building unless it’s headed to its rightful recipient, and with encryption we ensure that nobody can intercept your critical data. If your small business needs your data recovered from a crashed NAS server on the double, have no fear. Gillware Data Recovery is here. With our expedited emergency data recovery services, we can complete your data recovery case and send your data back to you in as little as one or two business days. Let Gillware Help You Today! No matter how simple or complex your NAS setup, Gillware has the specialists and tools to help.